Israeli forces kill two Palestinian civilians and wound another one, west of Ramallah. Five civilians, including three children, were wounded in different incidents in the West Bank. Israeli forces continued to use excessive force against peaceful protestors in the Gaza Strip. 92 civilians, including 26 children, two women, a journalist, and three paramedics, were wounded. The injuries of three of them were reported as serious. In the Gaza Strip, the Israeli forces continued to use lethal force against the participants in the peaceful protests organized along the Gaza Strip borders, which witnessed the peaceful protests for the 49th week along the eastern and northern border area of the Gaza Strip. They also continued to use force as well during the incursions into the West Bank. In the West Bank, the Israeli forces killed 2 Palestinian civilians and wounded 6 others, including 3 children. In the Gaza Strip, Israeli forces wounded 92 civilians, including 26 children, 2 women, a journalist, and 3 paramedics, while participating in the Return March. The injury of three of them was reported serious. In the West Bank, in new crime of excessive use of force, at early dawn hours Israeli forces killed 2 Palestinian civilians and wounded another one in Kaffur Ni’ma village, west of Ramallah. The Israeli forces claimed that the three civilians carried out a run-over attack, which resulted in the injury of two Israeli soldiers. Other Israeli soldiers opened fire at them, killed two of them and wounded another one. Investigations and eyewitnesses’ statements refute the Israeli forces’ claims. The eyewitnesses said that the three civilians were heading to their work at a bakery, where they should be at early hours. While the civilians were on their way to work, they were surprised with Israeli vehicles and crashed one of them. As a result, the civilians’ car hood was damaged. In the same context, Israeli forces wounded five civilians, including three children, during the Israeli forces’ incursion into Nablus. Palestinian young men and children gathered to confront the Israeli forces. In the Gaza Strip, using excessive lethal force against the peaceful protesters in eastern Gaza Strip, Israeli forces wounded 92 civilians, including 26 children, 2 women, a journalist, and 3 paramedics, while participating in the Return March. The injury of three of them was reported serious. As part of targeting the Palestinian fishermen in the sea, the Israeli forces continued to escalate their attacks against the Palestinian fishermen, indicating the on-going Israeli policy to target their livelihoods. During the reporting period, PCHR documented 3n incidents were as follows: 2 incidents adjacent to al-Waha Resort and 1 incident off Rafah Shore, north and south of the Gaza Strip. As part of targeting the border areas, on 28 February 2019, Israeli soldiers stationed along the border fence with Israel, opened fire at agricultural lands and shepherds, east Dir al-Balah in the central Gaza Strip. At approximately 11:30, the Israeli shooting recurred. On 02 March 2019, Israeli soldiers stationed along the border fence with Israel, opened fire at agricultural lands in the eastern ‘Abasan al-Saghira, east of Khan Yunis in the southern Gaza Strip. The Israeli shooting recurred on 04 March 2019. As a result, the farmers and shepherds were forced to leave for fear of their lives and no casualties were reported. During the reporting period, Israeli forces conducted at least 67 military incursions into Palestinian communities in the West Bank and 4 other incursions into Jerusalem and its suburbs. During those incursions, Israeli forces arrested at least 32 Palestinians, including 3 children and a woman, from the West Bank, while 11 other civilians were arrested from Jerusalem and its suburbs. In the Gaza Strip, on 24 February 2019, Israeli forces moved around 100 meters into the west of the border fence with Israeli, east of al-Buriej Camp in the center of the Gaza Strip. The Israeli vehicles levelled and combed lands, headed to the south and then arrived at eastern Khan Yunis before redeploying along the border fence. As part of the Israeli house demolitions and notices, on 02 March 2019, Husam al-‘Abasi self-demolished his house in Silwan village, south of occupied East Jerusalem’s Old City, to implement the Israeli Municipality decision under the pretext of non-licensing. He said that the Israeli Municipality issued a decision to self-demolish his house in Ras al-‘Amoud neighborhood in Silwan village and ordered him to demolish it or the Israeli vehicles will implement the demolition during 2 weeks. He added that that Municipality informed him that if he does not demolish the house, he will pay the demolition cost, which is estimated at NIS 80,000. He also said that he built a 70-sqaure-meter storey above his family house a year ago, where he along with his wife and their child live in. As part of seizing Palestinian civilians’ property in favor of settlement associations, Israeli settlers seized a building in ‘Aqabet Darwish in Jerusalem’s Old City. Eyewitnesses said that a group of Israeli settlers raided a house belonging to al-Halabi family while they were outside the house. The Israeli settlers closed the house with locks and then started to install cameras and put wires on the building’s walls and roof. It should be noted that the building belongs to Jerusalemite families. Around 60% of the building was given to the Israeli settlers while al-Halabi family managed to maintain the other 40% (100 square meters). Two of Jawdat al-Halabi’s heirs live in the building. In the same context, the Israeli authorities issued judicial notices against Maragha family, claiming their plot of land, where a building was established in Silwan village, south of occupied East Jerusalem’s Old City. Wadi al-Helwa Information Center said that “Ateret Cohanim” Settlement Association handed Maragha family judicial notices for 9 of the family members, claiming their plot of land, where a building was established in Baten al-Hawa neighborhood in the village. The building is comprised of 5 apartments and a parking. The building shelters 15 members. On 05 March 2019, Israeli forces confiscated a bulldozer belonging to the Israeli Ma’is Company. The bulldozer was cleaning rubbles on the main street near Doma village, southeast of Nablus. The bulldozer was taken to “Taffouh” settlement near Za’tarah checkpoint, south of Nablus. As part of the Israeli settlers’ attacks against the Palestinians civilians and their property, on 05 March 2019, a group of Israeli settlers, from “Yatizhar” settlement established in the northern side of ‘Oreef village’s lands, south of Nablus. The settlers raided Palestinian civilians’ houses and ‘Oreef Secondary School, under the Israeli forces’ protection. As a result, some windows belonging to Moneer Suliman al-Nori’s house were broken. In new crime of excessive use of force, at early dawn hours Israeli forces killed 2 Palestinian civilians and wounded another one in Kaffur Ni’ma village, west of Ramallah. The Israeli forces claimed that the three civilians carried out a run-over attack, which resulted in the injury of two Israeli soldiers. Other Israeli soldiers opened fire at them, killed two of them and wounded another one. Investigations and eyewitnesses’ statements refute the Israeli forces’ claims. The eyewitnesses said that the three civilians were heading to their work at a bakery, where they should be at early hours. While the civilians were on their way to work, they were surprised with Israeli vehicles and crashed one of them. As a result, the civilians’ car hood was damaged. According to PCHR’s investigations, at approximately 02:30 on Monday, Israeli forces backed by three military vehicles moved into Kafur Nie’mah village, west of Ramallah. They raided and searched a house belonging to Yousef Mahmoud al-Deek (42) and arrested him, taking him at the village entrance, where the Israeli vehicles stationed. One of the Israeli vehicles was damaged before their withdrawal from the village. At approximately 03:20, the three civilians were heading to their work via a car with an Israeli registration plate, meanwhile, the diver was surprised with Israeli vehicles at the village’s entrance. As a result, the driver could not control the car and crashed one of the Israeli vehicles. The Israeli soldiers immediately opened fire at the civilians, killed two of them and wounded another one. The wounded civilian was arrested while the victims’ bodies were kept in the Israeli custody. The two victims were identified as Ameer Mahmoud Darraj (20), from Khebitha al-Mosbbah village, and Yousef Raied Anqawi (20), from Beit Sirah village. The wounded civilian was identified as Hitham Basem ‘Alqam (20), from Safa village, west of Ramallah. Northern Gaza City: The Israeli shooting at Palestinian demonstrators resulted in the injury of 12 civilians, including six children. Two of them were hit with live bullets and shrapnel and ten were directly hit with tear gas canisters. Gaza Strip: The Israeli shooting at Palestinian demonstrators resulted in the injury of 28 civilians, including four children and a journalist. Ten of then were hit with live bullet and shrapnel and, 12 were directly hit with tear gas canisters and six with rubber bullets. The wounded journalist identified as Mohammad al-Dwaik was hit with a rubber bullet to the leg.Mohammad works as a reporter at Ithad Press. 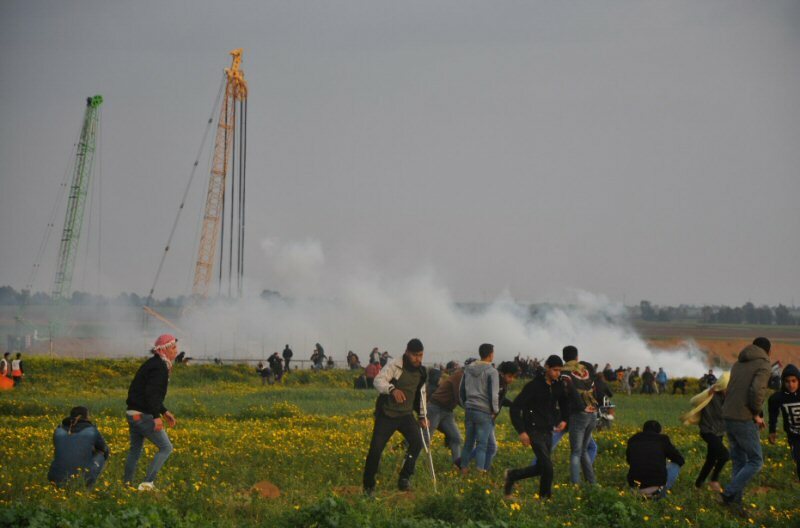 Central Gaza Strip: The Israeli shooting and throwing tear gas canisters at Palestinian demonstrators, which continued until 17:30, resulted in the injury of 18 civilians, including six children. Five of them were hit with a live bullet and shrapnel and 13 were directly hit with tear gas canisters and the injury of one of them was classified as serious. Khan Yunis: The Israeli shooting at Palestinian demonstrators, which continued until 17:30, resulted in the injury of 17 civilians, including six children, a woman and two Civil Defense paramedics. Doctors classified the injury of one of the children as serious. Rafah: The Israeli shooting and firing tear gas canisters at Palestinian demonstrators, which continued from 14:00 until 17:00, resulted in the injury of 17 civilians, including four children, a woman and a paramedic. Five of them were hit with live bullets and shrapnel and 12 were directly hit with tear gas canisters. Doctors classified the injury of one of them as serious. The wounded paramedic identified as ‘Abuld Razzaq Ibrahim Ijme’an Abu ‘Athra (36) was hit with a tear gas canister to the lower limbs. ‘Abdul Razzaq is a volunteer paramedic at the PRCS. On Sunday, 03 March 2019, Israeli forces moved into Silwan village, south of occupied East Jerusalem’s Old City. They raided and searched houses, from which they arrested Tawfiq ‘Othman, ‘Abed al-Raheem Khalil al-‘Abasi, Nidal Sufyian al-Natshah, Tareq Sa’adah al-‘Abasi, Majd Ahmed al-A’war, and Mahmoud Najeeb al-A’war. At approximately 01:00 on Monday, 04 March 2019, Israeli forces moved into al-‘Isawiyia village, northeast of occupied East Jerusalem. They raided and searched a house belonging to Omar Abu Suninah and then arrested him. At approximately 01:30, Israeli forces moved into a house belonging to Mohamed Khaled Sharirah in occupied East Jerusalem’s Old City and then arrested him. At approximately 02:00, Israeli forces moved into Beit ‘Anan village, northwest of occupied East Jerusalem. They raided and searched a house belonging to Wisam Hussain Rabie’ and then arrested him. Around the same time, Israeli forces moved into Badow village, northwest of occupied East Jerusalem. They raided and searched a house belonging to Hisham Hamidan and then arrested him. On Monday, Israeli forces arrested ‘Abed al-Rahman Mahmoud (39), from al-‘Issawiyia village, northeast of occupied East Jerusalem. ‘Abed al-Rahman was arrested after summonsing him for investigation in “’Ofer” Prison, west of Ramallah. He was then taken to al-Maskopiyia Police Station in West Jerusalem. It should be noted that ‘Abed al-Raham served 17 years in the Israeli jails and was released last week on condition that he will deport from his village to Jericho for 10 days. On Saturday, 02 March 2019, Husam al-‘Abasi self-demolished his house in Silwan village, south of occupied East Jerusalem’s Old City, to implement the Israeli Municipality decision under the pretext of non-licensing. He said that the Israeli Municipality issued a decision to self-demolish his house in Ras al-‘Amoud neighborhood in Silwan village and ordered him to demolish it or the Israeli vehicles will implement the demolition during 2 weeks. He added that that Municipality informed him that if he does not demolish the house, he will pay the demolition cost, which is estimated at NIS 80,000. He also said that he built a 70-sqaure-meter story above his family house a year ago, where he along with his wife and their child live in. On Tuesday, 05 March 2019, Israeli settlers seized a building in ‘Aqabet Darwish in Jerusalem’s Old City. Eyewitnesses said that a group of Israeli settlers raided a house belonging to al-Halabi family while they were outside the house. The Israeli settlers closed the house with locks and then started to install cameras and put wires on the building’s walls and roof. It should be noted that the building belongs to Jerusalemite families. Around 60% of the building was given to the Israeli settlers while al-Halabi family managed to maintain the other 40% (100 square meters). Two of Jawdat al-Halabi’s heirs live in the building. In the same context, the Israeli authorities issued judicial notices against Maragha family, claiming their plot of land, where a building was established in Silwan village, south of occupied East Jerusalem’s Old City. Wadi al-Helwa Information Center said that “Ateret Cohanim” Settlement Association handed Maragha family judicial notices for 9 of the family members, claiming their plot of land, where a building was established in Baten al-Hawa neighborhood in the village. The building is comprised of 5 apartments and a parking. The building shelters 15 members. The family said that they live in the building for more than 100 years and they have the documents proving their ownership. Moreover, Batn al-Hawa neighborhood committee said that Maragha Family building is part of “Ateret Cohanim” settlement association’s plan to seize 5,200 square meters of al-Hara al-Wosta neighborhood in Batn al-Hawa area. “Ateret Cohanim” settlement association claimed that the land belongs to Jews from Yemen since 1881 and the Israeli Supreme approved the seetler’s ownership to the land. The committee added that 30-35 residential building are established on the land threatened by “Ateret Cohanim” settlement association and around 80 families, including 436 members, live in it. The village’s residents live in the neighborhood 10 years ago after buying lands and property from form their former owners with official documents. At approximately 10:00 on Sunday, 03 March 2019, Israeli forces backed by 2 military vehicles and accompanied with a vehicle of the Israeli Civil Administration moved into Beit Ta’mour village, southeast of Bethlehem. The Israeli forces raided and searched a house belonging to Nayif Hasan Zawahrah (39) and then took photos of it. The Israeli Civil Administration officer handed Zawahrah a demolition notice under the pretext of non-licensing. It should be noted that the Israeli authorities handed Nayif a notice to stop construction work during June 2018. At approximately 15:30 on Tuesday, 05 March 2019, Israeli forces confiscated a bulldozer belonging to the Israeli Ma’is Company. The bulldozer was cleaning rubbles on the main street near Doma village, southeast of Nablus. After that, 2 military jeeps arrived at the area, stopped the bulldozer while working and then informed the diver that they want to confiscate the bulldozer without giving him any reasons. The driver told them that the bulldozer is licensed and belongs to Sadeq Murshed Bani FaDEL, FROM ‘Aqraba village, southeast of the city. The bulldozer was taken to “Taffouh” settlement near Za’tarah checkpoint, south of Nablus. At approximately 12:00 on Tuesday, 05 March 2019, a group of Israeli settlers, from “Yatizhar” settlement established in the northern side of ‘Oreef village’s lands, south of Nablus. The settlers raided Palestinian civilians’ houses and ‘Oreef Secondary School, under the Israeli forces’ protection. As a result, some windows belonging to Moneer Suliman al-Nori’s house were broken.